Dry skin is an extremely common condition that causes dry patches, flaking and itchiness. Some people naturally have dry skin, however it can also be caused due to cold weather, certain medications, hypothyroidism and dehydration. Dry skin is common in both men and women but it is more prevalent among older individuals. If left untreated, it can lead to cracks, rashes, eczema and even bacterial infections. Instead of slathering heavy duty chemical based moisturizers on the face, you can treat dry skin with some natural remedies like banana. Is Banana Good for Dry Skin? The water content in banana hydrates the skin and prevents it from drying and peeling. High level of potassium present in banana moisturizes the damaged skin cells and smoothens the rough texture of the skin. Vitamin E present in bananas fights skin damage and dryness caused by free radicals, UV rays and harsh weather. B-complex vitamins present in banana slow down the aging, reduces the appearance of wrinkles and fine lines associated with dry skin. 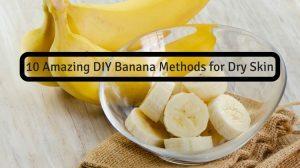 How to Use Banana for Dry Skin? Ripe banana can be used alone or in combination with other natural ingredients as an effective treatment for dry skin. Choose one among the below mentioned methods and try them regularly to treat dry skin. Take a ripe banana and mash it using a fork. Apply the mashed banana all over your face and body. Leave it on for 15 to 20 minutes and then take a shower or bath. Though it sounds weird, banana peel is useful for treating dry skin. Instead of throwing out the banana peel, you use it for the remedy. Cut a banana peel into thick strips. Rub the insides of the banana peels all over your face and body. Wait for 15 to 20 minutes and then take a bath or shower. Honey is a natural humectant that helps to retain moisture in the skin by drawing moisture from the air into the skin. In addition, the enzymes and nutrients in honey nourish and heal the damaged skin. Take 1/2 ripe banana and mash it using a fork. Add a tablespoon of raw honey to it and mix with a spoon. Apply this mixture all over your body, especially the dry areas like elbows and knees. Take a shower and dry with a soft towel. Lactic acid present in milk moisturizes and hydrates the dry skin. Potassium helps to solve the problem of itchiness and flaking. Selenium helps to reduce the appearance of wrinkles by protecting the skin against sun damage and free radicals. Take 1/2 ripe banana and mash it to make a paste. Add a tablespoon of full-fat milk to it and mix with a spoon. Apply this mixture all over your face and body. Take a shower with cool water and pat dry with a towel. Repeat this remedy once in 2 days for best results. Lactic acid present in yogurt dissolves the dead skin cells and provides a smooth texture to the skin. Yogurt is loaded with protein, calcium and vitamin D that nourish the skin and helps to keep it moisturized. Take 2 tablespoons of plain yogurt in a bowl and whisk it with a spoon. Take 1/2 ripe banana and mash it with a fork. Add the whisked yogurt to the banana and mix with a spoon. Take a shower and dry with a towel. The humectant and emollient properties of oatmeal help to moisturize excessively dry skin and prevents moisture loss from the skin. Add 1/2 cup of cooked oatmeal to it and mix with a spoon. Leave it on for 15 to 20 minutes and then take a bath using cool water. The healthy monounsaturated fatty acids present in avocado moisturize and hydrate the epidermal layer of the skin. Oleic acid in avocado regenerates the damaged and dead skin cells while the carotenoids protect the skin against free radical damage. Scrape out the buttery meat from inside the avocado and mash it with a fork. Mix both the ingredients to make a smooth paste and apply it all over your face and body. Leave it on for 20 to 30 minutes and then take a bath. Repeat this remedy 1 to 2 times every week. Butter is a rich source of fatty acids that moisturize even excessively dry skin. Its vitamin A content promotes collagen production and reduce the appearance of wrinkles. Take 2 tablespoons of butter in a bowl and whisk it with a fork. Take 1/2 of a ripe banana and mash it with a fork to make a smooth paste. Add the mashed banana to the butter and mix it with a spoon. The healthy fats present in olive oil moisturize the skin and forms a protective layer on the skin surface. Olive oil also promotes skin cells renewal and helps to remove the layer of dead skin cells from the skin surface. Take 1/2 of a ripe banana and mash it with a fork. Add 2 tablespoons of olive oil to it and mix with a spoon. Repeat this process 2 to 3 times per week. Vitamin C present in lemon juice is a powerful antioxidant that prevents skin damage caused free radicals. It also promotes elastin and collagen production in the skin. Add a tablespoon of freshly squeezed lemon juice to it and mix with a spoon. Note – Don’t go out in the sun after using this remedy because it contains lemon that can cause sunburns. Egg yolk is loaded with healthy fats, vitamin E and vitamin A that moisturizes the skin, protects it against the UV rays of the skin and boosts collagen production that addresses all the problems related to dry skin. Break 2 eggs and separate the egg whites from the egg yolks carefully. Add the whisked egg yolks to it and mix with a spoon. Take a shower with a mild body wash and pat dry with a towel. Applying banana packs can be a messy affair, so it’s best to try these treatments in your bathroom to avoid the mess. Banana might stick to the skin when it dries out. Do not rub or pull it while washing your skin. Massage the area with water till the dried banana pack comes out. You can use a natural moisturizer such as olive oil, coconut oil or almond oil to moisturize your skin after washing off these masks. Get an oil-based moisturizer or cream to moisturize your skin twice a day. Excessive exposure to the sun increases the dryness of skin, so make sure to use a broad-spectrum sunscreen every time you go out in the sun. Drink plenty of water on a daily basis to keep your skin well-hydrated. Don’t use harsh alcohol-based toners, astringents or cleansers. Hot water break down the lipid barriers in the skin and causes loss of moisture. So, it’s best to use lukewarm water for baths and showers. Did you try any of these remedies for treating dry skin? Then let us know which one worked best for you. Don’t forget to share your experience, remedies and tips with us in the comment section below.